An other worksheet about present continuous. 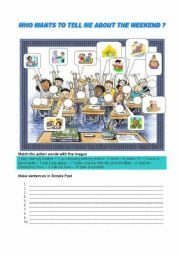 Of course, the worksheet can be used with Past continuous or whatever tense you are teaching. I found the picture very nice. 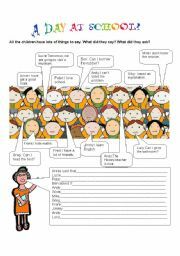 I also think that intermediat students could do the worksheet without the given vocabulary. 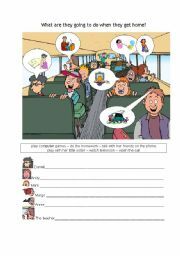 Students look at the picture and tell what people are going to do the next day, or if you want to change the title, you can use it for present continuous, past continuous or whatever you need. 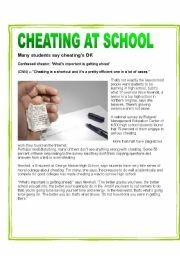 Reading about cheating at school and plagiarisme. 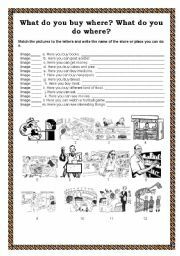 There are also questions about the text, a discussion and some exercises "what would you do if" The text is adapted from an article.Teh worksheet is meant for advanced adults and teens. WHAT�S YOUR NAME? hOW OLD ARE YOU?WHERE ARE YOU FROM? 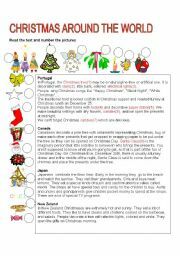 A very easy worksheet for young learners.It can be used in two ways. 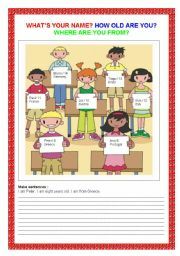 All children write the sentences, or each child chooses a caracter and his(her) neighbour asks the questions ( from the title) and the child answers following his caracter�s indication. A reading for teens or advanced adults about Christmas traditions in many countries. There are two activities. 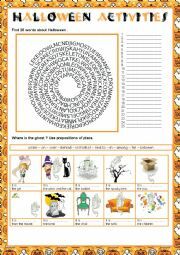 Students find 25 words about Halloween.In the second exercise, the students complete sentences with prepositions according to the pictures. WHAT DO YOU BUY WHERE? WHO WANTS TO TELL ME ABOUT LAST WEEKEND? Just an other exercise to revise Past Simple. 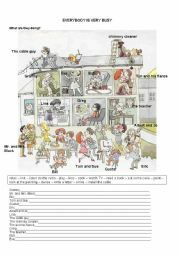 This is an animated presentation of tooms in the house for young learners. This is an animated presentation introducing meals. Prepositions for young learners. 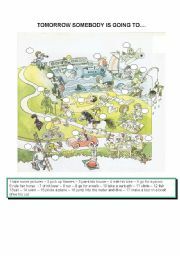 If the children allready know the prepositions, the teachers could remove the written part and let them tell where the ghost are. Children tend to love it because the ghosts move and some appear and disappear. This is an animated presentation of countries and languages. A powerpoint presentation about the body. Most of the body parts move. This is an animated presentation about animal abilities. Animated presentation of weather vocabulary. My original is with sound, but it�s too heavy. First part of an animated presentation introducing sports at the beach. It is very heavy, so there are two parts.